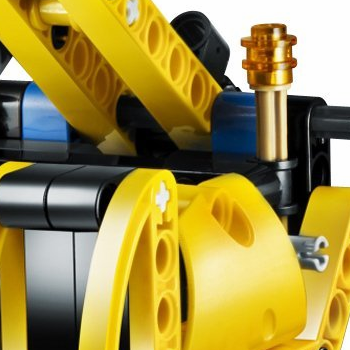 One thing I notice, is that the hype about new LEGO set releases (Technic in particular) is getting so high, that the time the fans need to dissect a model, once some new images debut online, is getting shorter and shorter. Incredibly shorter I'd say! And this is so evident, that today it took much less time than I needed to write a post about all the new images, for others to have found and documented online several new parts. Jovel Vlem sent me the image below left, for a new connector type, found in the 8047 Mini Excavator and tractor from 8049 Log Loader. But found it also reported into another image at LOWLUG forum (below right). An old wish, at the Barman's wish list at Brickshelf. 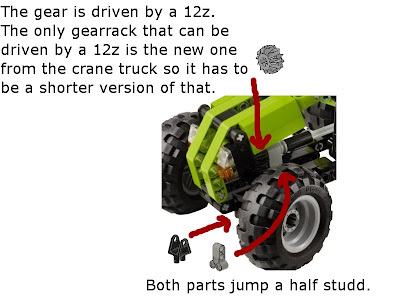 Also Jovel Vlem, sent me the image below with the finding about a new 4L axle with stop, also on 8047 mini Excavator. Meanwhile also Eric (Blakbird), reported what seems to be a new gear type, seen in the 8047 Mini Excavator Linear Actuator bracket acting as a gear box. 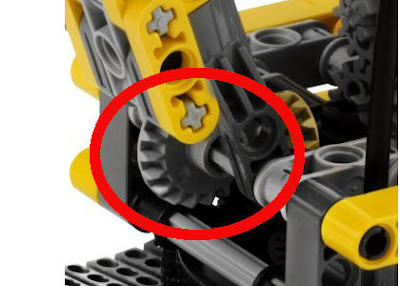 To me it looks more like a redesign of the 20 tooth bevel gear (32198). And for sure, you have noticed the more than evident new very small panels, on the 8047 Mini Excavator, 8048 Buggy and 8045 Mini Telehandler. Are you happy, with all these at once? Here an update with Jovel Vlem theory about the 7L gear rack. It makes sense at least, I'd say! Great News! I have so many uses for that new connector already! That 4L axle w/stop is straight out of my dreams! Looks Like Tan Axle is 3 long. In the A Model there are 2 at the rear of the Cab Roof. I think The Tan Axle looks Longer in the B Model because you see 1.5 above but you can only see 0.5 below! The tan axle on the penultimate photo is at least 4 studs long. For that new 20 tooth bevel gear, the most important new thing is that it is an idler! You can see that the axle hole is round, not cruciform, which allows it to spin on the axle. This is great in combination with the linear actuator brackets as gearboxes. 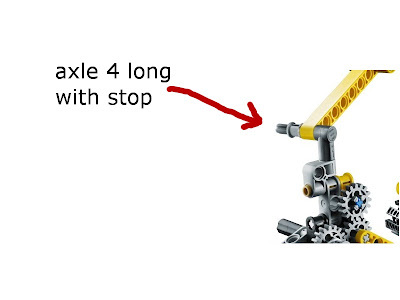 It allows you to use the gearbox axis as a rotation point for the boom, but NOT to transmit torque on this axle. It will allow much less friction when a gear has to pass over an axle which supports a large weight. Yes an idler will be very useful. As for the axle... it is indeed 3l +stud. In the gripper of the b-model it is used to connect the gripper to the arm, jut below the new 4L axle with stop. No mistake about it there. Good point Eric... I never considered that! I can't wait for that part! You can see that the axle that gear is on is fixed in place just outside the actuator bracket, which supports your arguement! So many new and useful parts at once! I guess they changed the colour of the "3 long axle with stop" to help differentiate it from the new "4 long axle with stop". 7L gear rack would be useful and the new connector looks very useful. Not sure about the new 4L axle but hey, a new part is always good (just as long as they don't come at the expence of a better part!). The new bevel gear also looks good but as it is I probably won't use/need it that often. The handle on 8047 B-model is also fixed with a tan axle with stud. There it is clearly a 3L axle! Do any of you see a logical reason why the axle should be Tan? I mean, I understand the change from black to blue in the long friction pins - it makes it easier to distinguish them from the standard friction pins. I also understand that the axle pins have been divided into friction (blue) and no-friction (tan, rather than grey to avoid confusion with the non-friction 'standard' pins). Maybe to better distinguish those with stop, from those with stud!? Always though the color coding has pros and cons... even if it was totally consistent, which hasn't been the case till now. Hopefully it will converge someday. Some of these new colors may not hold up. Look how the 1/2 pin http://www.bricklink.com/catalogItem.asp?P=4274 keeps flip-flopping back and forth through new sets between blue and light gray. Yes, that is curious. To be quite honest I never liked the way the blue 1/2 pins distort the colour of the trans parts that are stuck to it. What about the black part controlling the pitch of the shovel on 8047? I don't have and of those. No, these are the same as used in other SYSTEM sets. "Do any of you see a logical reason why the axle should be Tan?" And correct me if I'm wrong, but isn't it only standardized colors of Technic parts that are subject to change to another standarized color? I think I discovered yet another new piece in the Mini Telescopic Handler. At first, I thought there were two of them, (one making up the seat, the other one below it) but there seems to be only one of them. 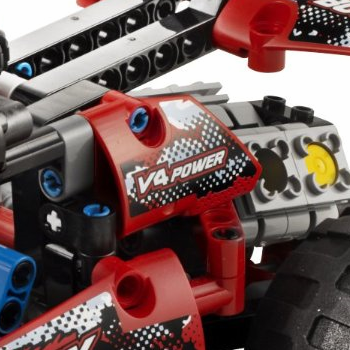 If you look below the seat in the hi-res images, you may notice a dark gray part that looks something like a TECHNIC Liftarm 2 x 4 L Shape, but it is missing the axlehole. Yes, you're right, Jetro. Upon closer inspection, I have determined that the new part I was thinking of is not there. There's the T-beam, and the part (or should I say parts?) beneath it seem to be just 2 of TECHNIC Beam 2 with Hole and Axlehole (60483). Sorry for the confusion. 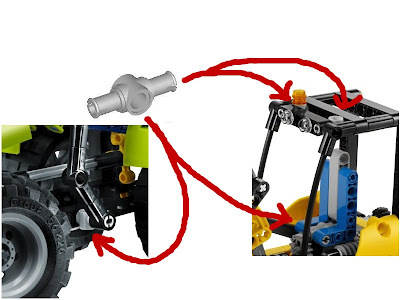 By the way, I think the Mini Telescopic Handler has one of those connectors that the Barman was wishing for (also in 8047 and 8049). You can see the new connector just to the left of the cockpit in the hi-res front 3/4 view of 8045. There's also one of those new small panels in 8045, visible just behind the exhaust pipe. 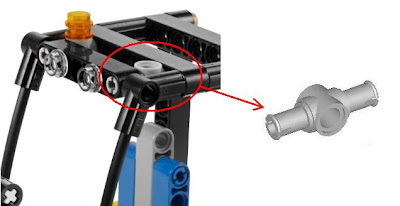 I think you are right about your comments, regarding new parts in 8045.